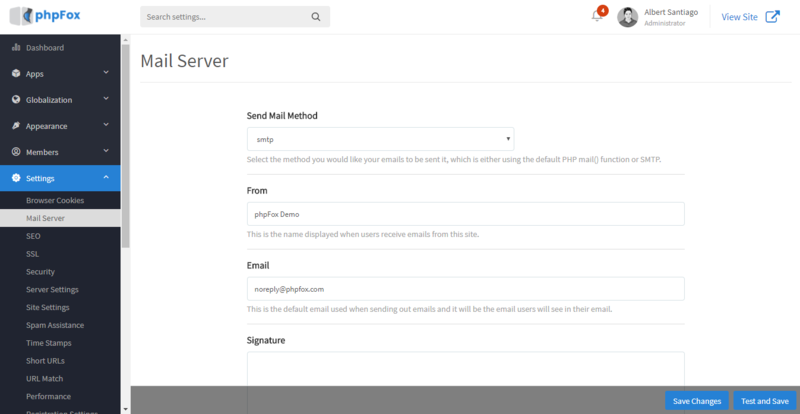 In order to deliver emails from your community to your users, you need to configure the Mail Server Setting. You can choose to send your email with the system mail function, or you can configure your community to deliver email via an external SMTP server such as your own SMTP server, or other third-party SMTP services such as Amazon SES, Mandrill, Google SMTP, Mailgun, Sendgrid, Sparkpost, etc. It is recommended to use a reputable SMTP service instead of the default mail function to achieve a high delivery rate. You can check our document on this setting at https://docs.phpfox.com/display/FOX4MAN/Setting+SMTP+Mail+Settings.